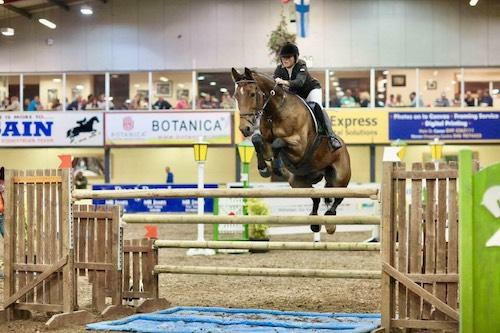 Dr. Laura Hutton grew up in an equestrian culture in Enniskillen, Northern Ireland and can’t recall a time when she wasn’t fawning over a pony in a field or a show jumper in the competition ring. She affirmed at an early age that she wanted to be an equine veterinarian, and she stuck to her ambitions. 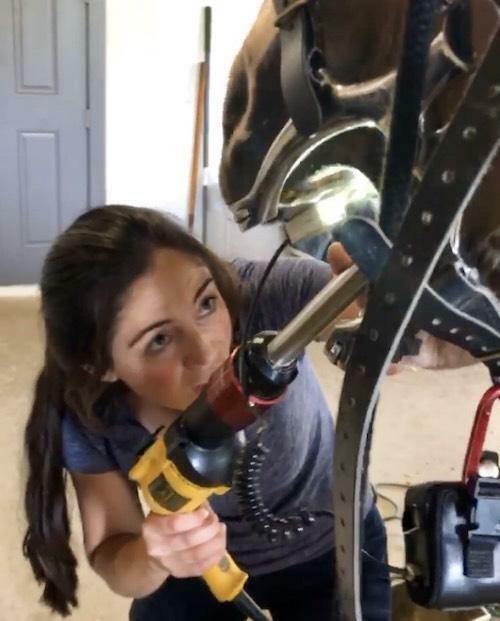 “I grew up around horses and I always wanted to be an equine vet or a professional show jumping rider, but I wasn’t good enough to do the latter!” explained Hutton, 27, who has now been working as a veterinarian at Palm Beach Equine Clinic for two years. What brought you to the U.S. and then to Florida? After I completed high school, I took a year off and was a working student at a show jumping yard in Ireland. When I went back to school, I studied at the University College Dublin’s School of Veterinary Medicine. The day after I graduated from veterinary school, I moved to the USA and completed a surgery internship at Hagyard Equine Medical Institute in Lexington, KY.
Dr. Laura Hutton competing in Ireland. In 2016, I headed south and accepted a position at Palm Beach Equine Clinic and have been there ever since! I love Ireland, but I found so many opportunities here in the States that I could not pass up. For example, I recently completed an acupuncture course. I always wanted to work with sport horses and I really couldn't be in a better place to do that; the volume and quality of horses that come through the clinic is incredible. The sunshine is pretty sweet too! What are your day-to-day responsibilities at Palm Beach Equine Clinic and what branch of equine medicine do you consider to be your specialty? Palm Beach Equine Clinic handles all kinds of treatments and I am an ambulatory vet, which means that my cases vary from lameness issues, medical cases, emergencies, and everything in between. I see so many unique cases, but the best ones are those that end with a pleased client. I remember I had a horse come in with a severe laceration that took six months to heal. When that horse was fully recovered, the owner was extremely grateful and that’s the best outcome we can hope for. I love the variety of ambulatory work, but I enjoy diagnosing and treating lameness the most. It’s like solving a puzzle, with the end goal being that I am able to help an equine athlete perform to the best of its ability. Dr. Laura Hutton on the job. What do you enjoy most about treating horses and being a part of the Palm Beach Equine Clinic Team? The best part about being an equine veterinarian, for me, is being around the horses all day! They're amazing animals and it’s a very rewarding responsibility to have a sick or lame horse in your care, treat it, watch it recover, and then see it doing well in the future. Palm Beach Equine Clinic is made up of a really talented group of people with years of experience. I am able to consult with those veterinarians and learn from them. Also, we are lucky to have the latest and most advanced treatments, technology, and medications at our fingertips at Palm Beach Equine Clinic. What can we find you doing when you are not working? You can still find me riding a bit here, but it’s never enough! I just bought a three-year-old in Ireland and I am hoping that in a few years he will be able to come over here with me. Other than horses, I am always trying to stay fit and have run in a couple marathons. But mostly, I enjoy being here in Florida with friends, having the craic!